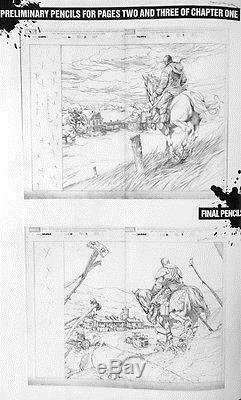 This is one of the first images Steve McNiven drew of Old Man Logan and the OML universe. Originally meant for publication until he decided to change the style from an Unforgiven-esque vibe to more of a Mad Max feel. Published in the back of the Old Man Logan TPB. Very rare opportunity to own a page from the series that inspired Hugh Jackman's last movie as Wolverine. Perfect for any Wolverine or Old Man Logan fan. Drawn on two sheets of Marvel comic art board, measuring approximately 22x17 in. 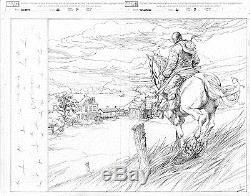 The item "Wolverine #66 pg 2-3 Unused DPS Old Man Logan Steve McNiven X-Men Marvel" is in sale since Sunday, January 22, 2017. This item is in the category "Collectibles\Comics\Modern Age (1992-Now)\Superhero\Wolverine". The seller is "sempercinema" and is located in Portland, Oregon. This item can be shipped to United States.